This article is a short summary of Kid Icarus: Uprising. Icaruspedia features a more in-depth article. 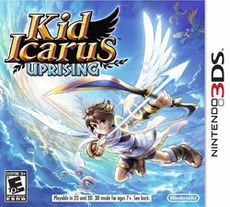 Kid Icarus: Uprising is the third game in the Kid Icarus series. Originally in development as a launch title for the Nintendo 3DS, the game was announced at E3 2010 with a planned 2011 release before being pushed back to 2012. The game serves as a revival of the Kid Icarus franchise, the last game being 1991's Kid Icarus: Of Myths and Monsters. The game was launched in a box set, which included, in addition to a copy of the game, a stand for the system to rest on during play and a pack of Kid Icarus: Uprising AR Cards. More cards were produced by Nintendo in two series. To promote the game's launch, a series of animated shorts from three different studios were released over Nintendo Video. Some 25 years after the original Kid Icarus™ game for NES™ captured the hearts and imaginations of gamers worldwide, Kid Icarus: Uprising brings the action and adventure of this beloved series to new heights – and new visual dimensions – on the Nintendo 3DS™ system. The dark goddess Medusa and her Underworld Army have returned, and they’ve got their sights set on the heroic angel Pit. With the aid of Palutena, goddess of light and guardian of the human race, Pit must fend off this malevolent threat. The richly immersive graphics of the Nintendo 3DS system offerincredible depth as Pit battles enemies by air and by land. Designed by Masashiro Sakurai – creator of Super Smash Bros.™ – Kid Icarus: Uprising is an epic, action-packed odyssey that unfolds with stunning 3D visuals. The game also includes fully-voiced levels and an amazing soundtrack. A wide variety of collectible weapons offers an extraordinary amount replay value. With 9 different categories of weapons, ranging from Bows to Claws, players can learn the unique characteristics of each weapon and determine which is best suited for each battle and their style of play. Some 25 years after the original Kid Icarus game for NES captured the hearts and imaginations of gamers worldwide, Kid Icarus: Uprising brings the action and adventure of this beloved series to new heights —on the Nintendo 3DS system. The dark goddess Medusa and her Underworld Army have returned, and they've got their sights set on the heroic angel Pit. With the aid of Palutena, goddess of light and guardian of the human race, Pit must fend off this malevolent threat. The richly immersive graphics of the Nintendo 3DS system offer incredible depth as Pit battles enemies by air and by land. Twenty-five years after the events of the original Kid Icarus, the Underworld Army is terrorizing humanity, and Pit is sent out to stop them and eventually their leader, Medusa. After defeating Medusa, however, it is revealed that she was simply a cover for the true leader of the Underowrld Army, Hades. Pit and Palutena must now work to stop Hades from taking human souls, while on the way working to prevent several other forces from taking over. Kid Icarus: Uprising is a chapter-based game with two primary gameplay styles: stages typically start with Air Battles, then transition to Land Battles. In Air Battles, the game plays like a rail shooter, in which the player moves around to avoid enemy projectiles while trying to shoot as many enemies as possible. In Land Battles, the game plays similarly to a third-person shooter, in which the player uses the touch screen to control the camera while shooting at enemies. Difficulty of a chapter is determined by intensity: the player can bet more hearts to increase the difficulty, while higher difficulties usually give the player more hearts per enemy and allow access to special areas, as well as better item drops. If the player dies at any point, hearts are lost and the difficulty is lowered. Hearts can also be used to purchase items, while better weapons can also be obtained by fusing weapons and combining their stats. Different types of weapons are available, which have different effects and different styles of play. Players can also share weapons over StreetPass. This page was last edited on 24 October 2016, at 20:10.